NEW YORK (WABC) -- As the Mets take on the Cubs in the National League Championship Series, it adds another chapter to the competition between the two cities. It's the Big Apple against the Windy City, or as an article in the New Yorker once dubbed it, 'The Second City'. When it comes to baseball, Chicago fans have suffered far longer than their New York counterparts. The Cubs last world championship was way back in 1908, and they haven't reached the World Series since 1945. The last time the Mets won it all was 1986, and their most recent trip to the World Series was in 2000. But it's a rivalry that extends well beyond the ballfield. Chicago's Willis Tower, known to most as the Sears Tower, is the second tallest building in the U.S. at 1,729 feet. But New York holds the title for tallest tower with One World Trade, which is 47 feet taller. 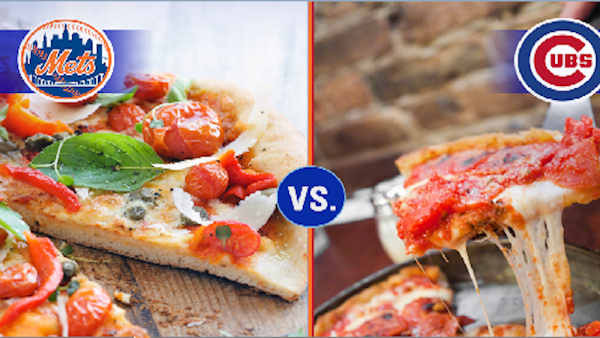 Of course, there's also the age-old debate: Which city has the better pizza? It's New York thin crust versus Chicago deep-dish. And then, the hot dogs, New York or Chicago style. The meat is totally different, and the toppings: For instance, New Yorkers prefer their dirty-water dogs to the loaded Chicago-style franks. When it comes to fun and games, both cities have their popular spots. In New York, the Coney Island boardwalk is the place to be for summer-time fun. But Chicagoans enjoy their carnival rides at the city's Navy Pier. As for shopping, New York has Fifth Avenue, Chicago has the Magnificent Mile. The stretch along Chicago's Michigan Avenue is known for its upscale shopping and restaurants. Chicago Mayor Rahm Emanuel has proposed the following NLCS bet to Mayor Bill de Blasio. And a personal donation by Mayor de Blasio to be split between two youth programs -- After School Matters, which offers 15,000 Chicago teens out-of-school activities in the arts, communication, sports, science & technology, and Becoming a Man, which works to prevent young men from dropping out of school and engaging in violence through in-school and after-school activities.